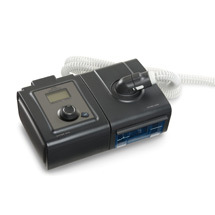 The 60 Series Pro combines the proven comfort of C-Flex Plus pressure, the smart technology of Auto-Trial and CPAP-Check, and the leading edge advancements in humidification that come with the System One 60 Series Heated Tube Humidifier with Heated Tube. CPAP Check mode checks on the user every 30 hours to determine if therapy pressure is optimal. If not, it automatically adjusts the nightly fixed CPAP pressure by 1 cm H2O (with maximum upper and lower limits of 3 cm) to obtain an ideal pressure. Auto Trial mode delivers breath-by-breath Auto-CPAP therapy for up to a total of 30 days. At the end of the Auto-Trial period, the device will automatically transition into the CPAP Check mode at the 90% auto CPAP pressure.